This time it was with regards to its contribution to the risk of heart disease. The study, run out of Canada's McMaster University by Dr. Salim Yusuf, was not a small study. It analyzed the dietary patterns of 16,000 individuals in 52 different countries and concluded that what we've been saying for years is still true - diets higher in fruits and vegetables and lower in fried foods and animal meat are healthier for you, and in this study specifically healthier for your heart. "What we've shown is if you eat a healthy diet you can actually reduce the risk of heart attack by about 30 to 40 per cent. That is bigger than most drugs we have for protecting against heart disease. It's even bigger than an angioplasty or bypass"
The study was funded in part by the Heart and Stroke Foundation. "It's a large international study that I would say reconfirms what is suggested in the literature in smaller studies that we are what we eat"
I'd agree. It does "reconfirm" what we already know to be true. Here we've "reconfirmed" that meat's in fact bad for your health whereupon folks who ate the most meat (by quartile) had an increased risk of heart attack. Take this new data and add it to that which concluded that diets higher in red meat are associated with dramatically increased risks of multiple cancers, (colon was the strongest where every 48 grams of red meat consumption beyond a weekly limit of 500grams increased colon cancer risk by 15 per cent) and diabetes (for every increase in the number of daily servings of red meat there was a 26% increase in the risk of developing diabetes), and you've got to wonder how any credible medical or public health organization can actually recommend its consumption. 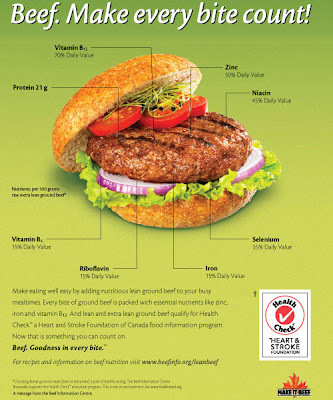 "makes healthy choices easier by helping you quickly identify products that can contribute to a healthy diet"
So for the scorekeepers out there - here's more evidence, this time from a Heart and Stroke Foundation funded study, "reconfirming" what we already knew about red meat consumption, evidence that states that meat consumption raises the risk of heart disease, and yet here we also have a Heart and Stroke Foundation who happily stamps its Health Check logo all over it and Health Canada who publish a "Food Guide" that doesn't caution against its consumption. Any guesses when either will change their tunes?